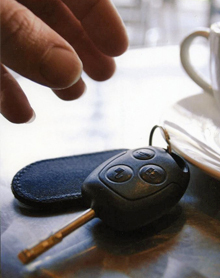 We provide a rapid response service for lost car keys 24hrs a day 7 days a week. We provide keys for a wide range of vehicles, even if you have lost all your keys or just require a spare set. Lost keys are cut to fit the existing locks in the car which ensures the key is a perfect fit. Lost car keys can be erased from your car immobiliser ensuring they can no longer start your vehicle. Immobiliser systems are fitted to all new cars (since 1995) and require a coded transponder car key. Using the latest technology we ensure your replacement key is coded appropriately. If you have lost or had your keys stolen we have a mobile van with key and programming equipment to help sought your keys out on the drive or by the roadside. If you simply require a spare key, you can visit our shop and have a key copied whilst you wait from as little as £35.00. Remove broken keys from ignitions and door locks without the need to replace the lock. If your vehicle make isn't shown below we can still help. Please call 0121 783 0442 for more details.